If you choose to perform dialysis at home, you have two options – Home Haemodialysis or Peritoneal Dialysis. These options allow you to manage your condition and meet your health goals at home. These therapies will be outlined in more depth in this chapter. 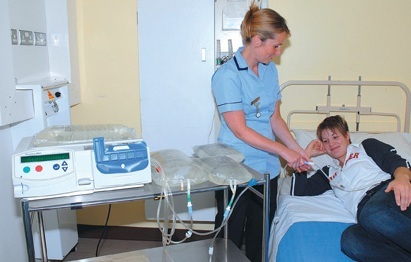 Home Haemodialysis (HHD) in Beaumont Hospital is an option of kidney replacement therapy. This is an ideal therapy for patients who will be waiting a prolonged time or, who are unsuitable for a kidney transplant. Once you have discussed this option with your consultant, you will be referred to the home therapies team. An appointment will be made, with you, to discuss this option in more detail. This discussion usually takes about an hour. Your partner/friend is encouraged to attend this appointment with you both for support and to listen to the information being delivered to you. Prior to commencing the programme, you must have a functioning arterio venous fistula and the skill to self-needle your fistula (this skill will be taught to you, over a period of time in your dialysis unit). However, if you have a dialysis line you might also be referred for HHD. It will be necessary for a house assessment to be carried out to assess the suitability of room size, electric and plumbing access and water quality. This assessment is completed by the service provider and a member of the haemodialysis training team. The water testing results take up to six weeks to be reported on and it is essential to have these results before training commences. When they are available, the team will organise a date to commence training. When you arrive at Beaumont Hospital to commence your training, it will take place in a designated HHD room and one-to-one care and training will be provided. Training takes place on Monday, Wednesday and Friday at 08.00am for approximately 6 weeks. The first five weeks of training will take place in Beaumont, and, if you and the team feel you are ready, the last week (week 6) is provided in your home. Depending on where you live, the days and times may vary. During your training in Beaumont, you will also meet with the renal nurse counsellor and the dietician. therapy in your home. There is no cost to you for this conversion. Waste disposal equipment including a sharps bin, healthcare risk waste bags and a wheelie bin. provider have a 24 hour, 7 days a week helpline and your clinical support team, at Beaumont, also have a dedicated 24 hour, 7 days a week helpline. Not needing to travel to and from the hospital 3 times a week for dialysis. 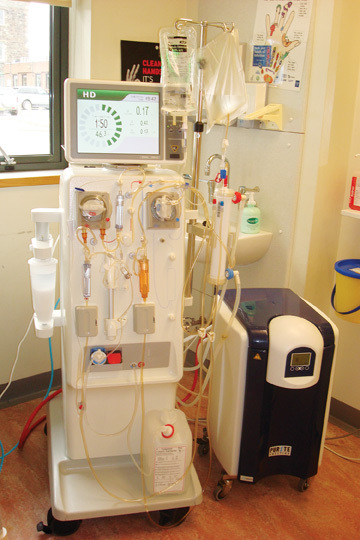 Having your dialysis when it suits you, as discussed with your home dialysis team. Choosing to have longer dialysis sessions and, more often than the three times weekly. This will certainly benefit your health and you can be more flexible with what you eat and drink. Taking more control of your condition. You have to set up and dismantle your own dialysis machine for each treatment. You require a dedicated space in your home for storage of dialysis equipment. Home Haemodialysis may not be right for you at this time. You may want to think about selfcare dialysis in a unit, perhaps then deciding to make the move to home haemodialysis. 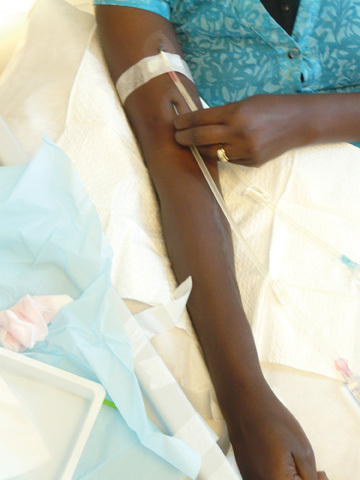 Peritoneal dialysis is another form of kidney replacement therapy. The peritoneum is a membrane which lines the abdominal cavity. Surrounding and protecting many of the body's internal organs, it has a rich blood supply, making it an ideal area in which to carry out dialysis. Peritoneal dialysis involves the use of the peritoneal membrane, as a filter, to remove waste products from the body and to correct body fluid and biochemistry. This is achieved by inserting a catheter (tenckhoff) into the peritoneal cavity by way of a minor operation. About 15 cms of the catheter remains outside of the body, providing a means for attaching a bag of special dialysis fluid (dialysate). The dialysate fluid and the peritoneum work together to remove waste and excess fluid from your body. 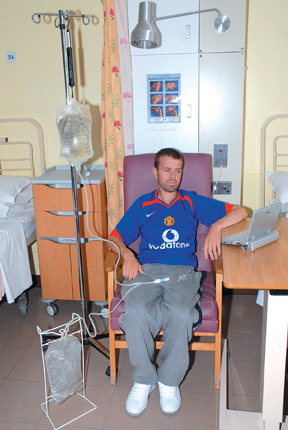 dialysis is carried out in your own home. Patients will be assisted by their renal team in choosing the dialysis therapy that best suits their medical and personal needs. Should I Chose Peritoneal Dialysis (PD) Or Haemodialysis (HD)? Both peritoneal dialysis and haemodialysis are equally effective for treating kidney disease in the short to medium term. Your choice of treatment depends on the way you want to live your life. In haemodialysis (HD), you receive your treatment every second day. You will have 4 days off every week. With peritoneal dialysis (PD), you need to do your treatment daily in either four 20 minute exchanges or 8-10 hours overnight whilst you sleep. In HD, the nurses carry out the procedure when you come into the unit. PD is a self-care treatment. With PD, it is sometimes easier to work or have a good quality family life. Your treatment is performed at home. Therefore, you are not making as many trips to the hospital. It is often easier to arrange a holiday on PD. Your dialysis fluids can be delivered to your destination, home or abroad. PD often works well for people who have had difficulties with dialysis access. PD allows you to drink more fluids, as the excess can be taken off each day. With PD, you need to have reasonable eyesight and manual dexterity to carry out the exchanges . Patients who have had extensive abdominal surgery will generally not be suitable for PD. Your nephrologist will sit down with you and discuss, in detail, which form of dialysis bests suits your situation. It is often possible to switch from PD to HD or HD to PD after a period of time, on each treatment, if it does not agree with you. With PD, dialysis is taking place inside you without you being aware of it. 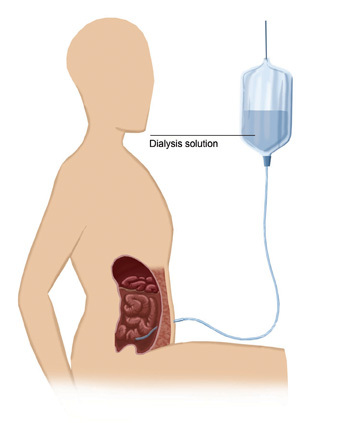 CAPD is a process by which 2-2.5 litre bags (depending on your prescription) of dialysis fluid are instilled into your peritoneum, four times a day, via your Tenckhoff catheter. Different strengths of dialysis fluid are available, and your doctor and PD nurse will explain which fluids best suit you. 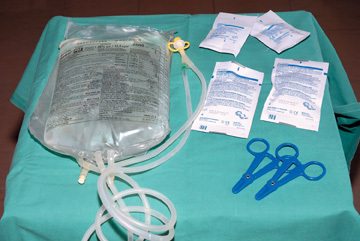 Each dialysis fluid bag contains different amounts of glucose. The three main types of fluid used in Beaumont are 1.36%, 2.27%, 3.86%. The stronger the glucose solution, the more fluid will be removed from your body. This fluid is left in the abdominal cavity and removed 4-6 hours at the next exchange, and then fresh solution instilled, which takes approximately 30 minutes. Before you connect the bag of fluid, to your catheter, you will need to wash your hands and prepare a clean area. The bags we use at present are a ‘DISCONNECT’ system. 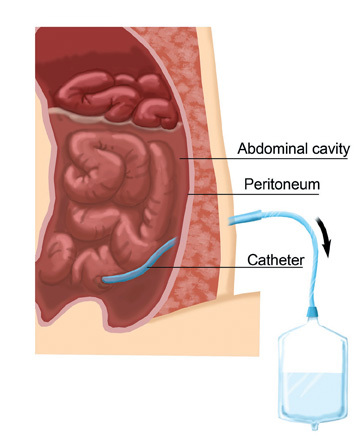 When you are prepared to carry out an exchange, you will connect the new bag to your catheter, open the seal and allow the fluid in your abdomen to drain out. Once the fluid is completely drained, you will clamp that bag and open the new bag and allow the fluid to drain in. Once the full amount of fluid has drained into your abdomen, you will disconnect the bag and then go about your business for another 6 hours. APD is an overnight treatment ranging from 8–10 hours, this treatment involves the use of a machine, to perform the dialysis whilst you sleep. A small volume of fluid remains in the abdomen all day, and at night when connected to the machine, the fluid is removed and replaced at intervals. As a patient, on dialysis, it is very important to be careful about the amount of fluid you drink. Your doctor/nurse will inform you of the amount of fluid you can take on a daily basis. This amount is reviewed regularly, as it may change taking into consideration urine output. However, most patients lose their urinary output within the first year of dialysis treatment. The amount of fluid removed, at each session is determined by the type of dialysis bag that is used. By increasing the concentration of glucose in the bags, more fluid can be taken off. The three main types of fluid used in Beaumont are 1.36% (light bags), 2.27% (medium bags), and 3.86% (heavy bags). There is also a very strong bag called Extraneal, which has the strongest fluid removal capacity. You and your doctor will develop a prescription of the PD treatment, using, for example, three light bags and one extraneal bag, or one light bag, two heavy, and an extraneal at night. The prescription will be individualised, for yourself, and may change over time. It is important to record your dialysis prescription, weight and the amount of fluid that is removed on a daily basis. This shows clearly how well dialysis is working for you. It is important that these records are brought along to clinic appointments, so that your team can review them, and make changes in your treatment if required. Loss of ultrafiltration/ inadequate dialysis. Peritonitis or infection in the peritoneal space is the major complication of PD. Sometimes bacteria may enter into the abdomen, either through the tube or along the skin at the exit site. If this develops, it can be quite a severe illness requiring urgent treatment. Peritonitis will be recognised by the development of pain in the abdomen, usually associated with the development of the fluid bags looking very cloudy after they have been drained out. If you develop peritonitis it is important that you contact the kidney unit immediately. You will need to bring the cloudy bag of fluid for analysis by the laboratory. Although patients worry a lot about peritonitis, it is, in fact, relatively uncommon, occurring on average once every two years. It is also true to say that the majority of peritonitis episodes will be treated by a short course of antibiotics. When you come to the hospital your doctor will order a white cell count on the PD fluid and a culture of the fluid. You will be started on antibiotics and the fluid will be analysed, daily, to determine if the peritonitis is getting better. Occasionally, if the peritonitis is persisting, the nephrologist may recommend the catheter to be removed, in which case you would have a smal surgical operation to take out the catheter. If the catheter has to be removed there may still be the possibility of going back on PD some months after the infection is cleared up. In the meantime you will be required to change to haemodialysis treatment and will need to have a permcath inserted. It is a big mistake to delay having the catheter removed if the peritonitis is not getting better as you may become very ill. Generally, once the catheter is removed, you start to feel better in a few days. Where the catheter enters the skin, this is called the exit site. This area is prone to infection, particularly early after the catheter is inserted. It is important that this area is observed every day, and if you notice redness or fluid draining from it, you should inform your nurse immediately. This may require treatment with tablet antibiotics or antibiotic cream. If this infection is not treated promptly, it may go on to form what is called a ‘tunnel tract infection’ where infection develops in the tunnel through which the tube passes. This is more difficult to treat. might need to change to HD treatment, until the wound/leak has healed. Large amounts of fluid, in the abdomen, may cause small hernias to develop around the abdomen button or in the groin. If these develop, they will require surgical procedures to repair them. From time to time, the Tenckhoff catheter may become blocked. This may result for a number of reasons. Firstly, constipation can affect dialysis flow rate. If this happens you should take some laxatives to keep the bowel regular. The catheter may move position in the abdomen so that it is no longer sitting in the pelvis. If this happens and cannot be unblocked, the catheter may need to be repositioned, by way of a small operation. Occasionally, the catheter becomes blocked by way of a little fibrin plug in the abdomen. This can often be unblocked by flushing the abdomen with fluid. When you have been on peritoneal dialysis, for many years, the peritoneal membrane may become somewhat scarred, resulting in less efficient dialysis and inability to remove fluid. This can be examined by measuring the KT/V and a PET test. If you are not feeling well, and these parameters suggest the peritoneum is becoming scarred, you may need to switch to haemodialysis permanently. If this problem becomes severe, it may result in considerable scarring in the peritoneum treatmentcalled sclerosing peritonitis. If you select PD, as your treatment choice, you will have continued support from the kidney team. You will be reviewed by your consultant at a special PD Clinic once, every 2 months or sooner, if needed. However, you have the choice to contact the kidney ward, at any time, to speak to staff. PD staff are provided from 7.45am to 8.30pm. A home visiting service is available from the Beaumont PD staff.